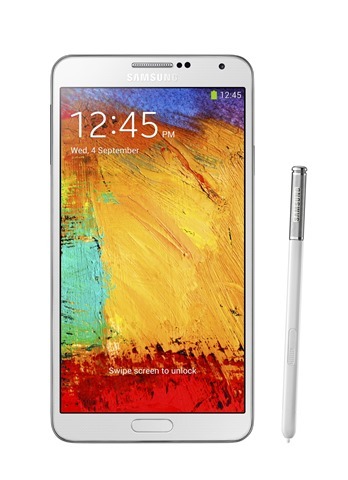 Samsung Galaxy Note series is different because it offers large screen real estate along with a stylus to take full advantage of this extra large screen. The S-Pen from Samsung has improved over generations of Note series devices. Besides some minor difference in hardware (S Pen now works on capacitive buttons as well), various new features have been added on the software front. When you draw out your S Pen from its resting place in the body cavity, it triggers the Air Command radial menu on your note screen. Other way to trigger the Air Command is to press the Button on the S Pen and hover it over the screen. You will notice the following options in the Menu. 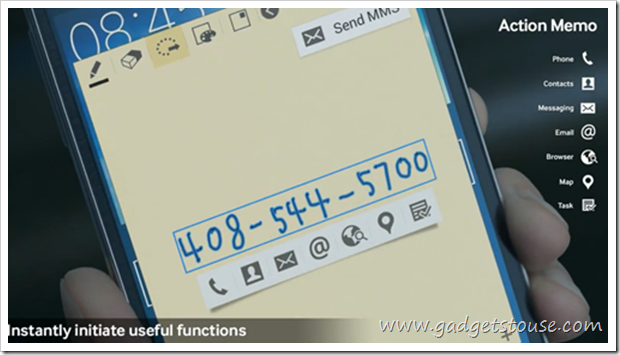 It is one of the most useful added features in the S-Pen. 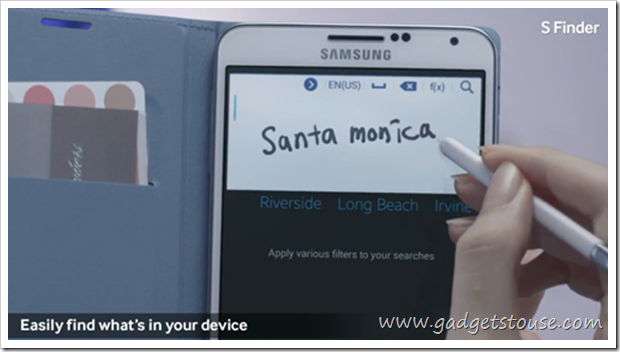 When you tap the Action Memo from your S Pen, a Pad shows up on your screen on which you can scribble anything including a number, email address, name or search query. Then you can tap on “Link to action” option and your Note 3 will recognize your text and convert them to legit fonts and then you can choose from number of options including Dialing a number and launching it as Google search query. If a Google search query pops up in your mind all of a sudden, you can just scribble it over your Action Memo pad and link the action as Google search. While traveling, you can just scribble the name of a place and launch the Action Memo button to directly locate it on Google Maps. This is a simpler feature which lets you mark anything interesting you come across while surfing the web and store it on your Scrap Book to view later. You can also add tags, notes and images and categories to the content you store in your Scrap Book. 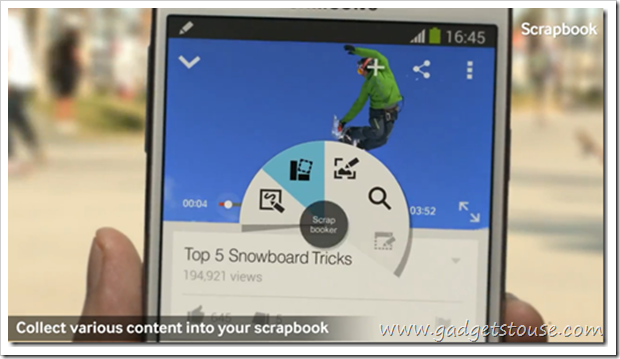 All you have to do is select the Scrap Book option from Air command and encircle anything, including You Tube Videos with your S Pen and you are good to go. This comes in quite handy while you come across anything on the web and want to save it for a detailed or second view later, much like book marking but you don’t have to share the entire page, just the selected stuff that you need. When you are searching a specific project related content , you organize it in a particular category and efficiently and quickly keep loading it with whatever you come across with great ease. When you tap on Screen Write, your Note 3 will take the screen shot of your display and open it in a simple editor, where you can doodle on top of it or crop it or directly share it with over various mediums. If you want to give directions to someone, or share your exact location, You can switch on the GPS and zoom in on Google Maps. You can take a easy screen shot and share it. You can also draw a particular Route on the Map and share it with your friend. While you are helping a friend use a certain App, you can send him a screen shot drawing arrows and writing short notes to help him through. As the name suggests this feature is an easy and effective way to search from large content that you store on your Note 3 over a period of time. 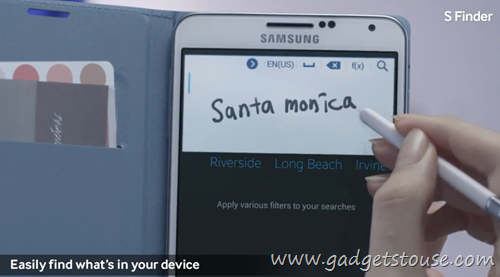 This feature also helps you search S Pen drawn symbols along with the regular content which makes it a need. Once your device is loaded over with months of content and you don’t remember under what category of sub category in your Scrap Book or Evernote did you file required content, you would find this feature a life saver. With Pen Window Samsung has provided with an effective way of multitasking. You can draw a small size window using your S Pen over already open window and open other selected apps in that small window. 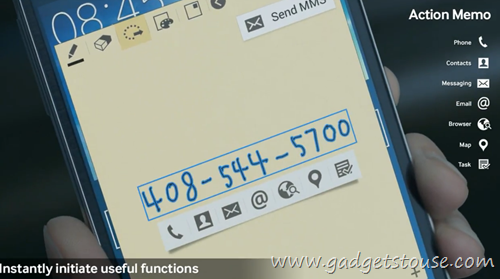 You can perform various quick tasks by opening Apps like Calculator, hangouts, browser, etc. When you are on a call and talking numbers, it provides you with an easy option of opening a calculator in a custom sized window and perform quick calculations. When you are going through a document or a web page, you can discuss your findings by drawing a small Hangouts window. All of these S Pen features are quite accurate and thus make S Pen the most desirable Stylus device out there. Most users would tell you that S Pen is rarely used, but those who do use it, love it and find it very productive. Your Note Unlocks as soon as you draw it out and with such handy software additions, we expect the market share of people desiring a S Pen device to grow many folds.